The darkening skies hurried towards us like pallbearers to a newly arrived hearse. 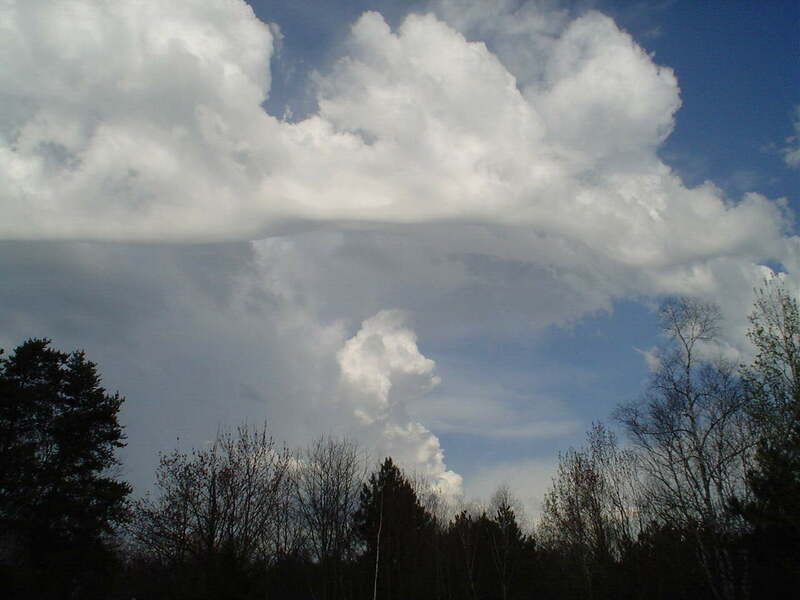 The temperature plummeted from over 90 F (35 degrees C) to 60 F (15 C) in 30 minutes. It all foreshadowed events we could not predict. We did not know what it would be or when it would choose to attack, but we knew the assault was likely. Goosebumps stood out on my arms from the sudden coolness and the anticipation of the assault. We were high in the Big Horn Mountains, having made the ascent by roaring up perfectly graded switchbacks to the last lookout where we stopped to look back at Sheridan, Wyoming, now a miniature village in the valley 5000 feet below us. We picked up our pace, hoping to make it through the pass and down the other side before the brooding beast struck. 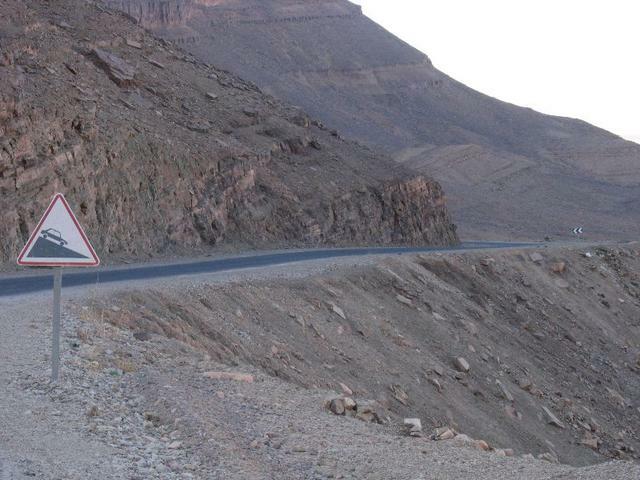 But our effort was in vain as we encountered roadwork near the summit. 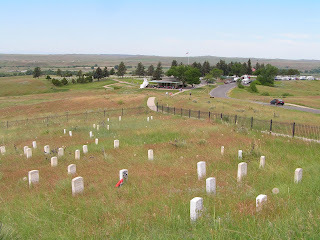 For several miles we doddled and detoured around the work on a freshly graded, gravel and sand surface, slipping and spinning as we followed a funeral-like procession of vehicles. There was nothing we could do except endure the temporary hold up and then pass the slow moving line up on the straight stretches ahead. We were impatient to get over the mountains and down to the valley on the other side, stopping only for a photo of a grazing moose. We were beginning to think we had escaped the anticipated fate as we started down the steep grade marked by repetitive signs, "Caution Steep 10% Grade". You know, the yellow ones with the image of a car looking like it is driving down a boat ramp to a watery grave. We learned later that 10% was the steepest incline sign that Wyoming had and our actual grade of descent was probably 15% or more in places. Through e could see and longed for the safety and sunshine of the valley floor through the gathering gloom but we knew it was too late. 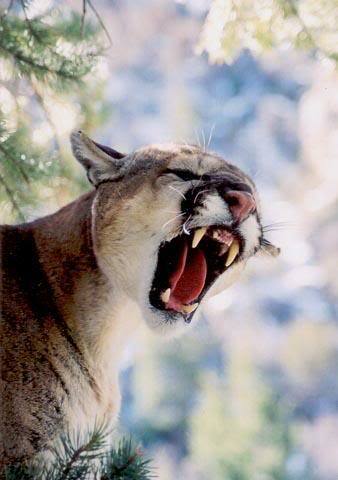 The storm struck with the speed and desperation of a wounded mountain lion. Its claws lashed out in the form of lightning that lit the darkness, momentarily slashing the dark clouds then retracting to some hidden sheath to wait. A growling roar of thunder echoed across the face of the mountain, the road shaking in fear. The wind joined the battle scene feinting and jabbing like a boxer, swooping from behind a rock outcropping then ramming its fist into our backs by surprise. It whirled and punched with alarming variety, first pressing hard, then backing off suddenly, then slamming us from all sides at once. We were defenceless. Our bikes rocked and bucked like rodeo broncos out of control. The gusts picked up hands full of sand from the rough roadway and threw the grit at our faces, stinging skin and getting in our eyes. 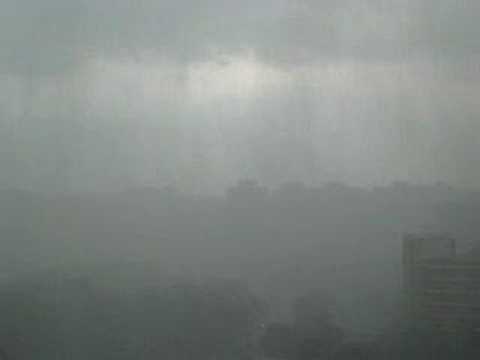 And then the rain began. First dabbing our windshields it quickly progressed to wetting our motorcycle coats and helmets. I began to dearly miss my wind-wrecked visor for the first time as the wind whipped the rain like small nails being thrown at my face. Soon the rain was drenching us, too late to put the rain gear on. Besides, where could we stop without endangering ourselves in the path of cars with wipers slapping at the flooded windshields. We would be risk our bikes suffering serious damage by being blown over in the wind. I pressed on down the 13 miles of mountain highway 14A that was treacherous beyond anything experienced. I was drenched to the skin and wondering what was in front of my smeared and water-streaked glasses. I was fearful of stopping yet afraid to keep going. The latter seemed the lesser of the two mortality-testing choices. I crept slowly as if blind down the descent, around each corner, rock wall on one side and cliff on the other. I crawled down the face of the mountain like a wounded climber getting off the summit before any disaaster would result. Finally, we all arrived at the first town in the valley and breathed in deeply, as if for the first time since leaving the top. The adrenalin had amplified my Parkinson's tremor so much that I could only keep from totally losing control by gripping the right handlebar grip as if my life depended on it. We were grateful to arrive soaked but unscathed. Surprisingly, by the time we got to our destination, Cody, Wyoming, some 45 miles further, we were all dry and warm again, the mountain ordeal having already faded to more 'exciting' than frightening. However, we all admitted it was the worst driving conditions we had ever encountered astride a motorcycle. We had survived the attack on the mountain and were happy. 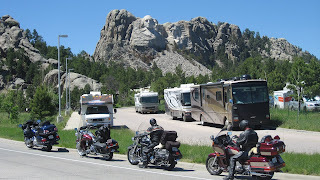 Sturgis, South Dakota, does not look like a famous town, but it is. 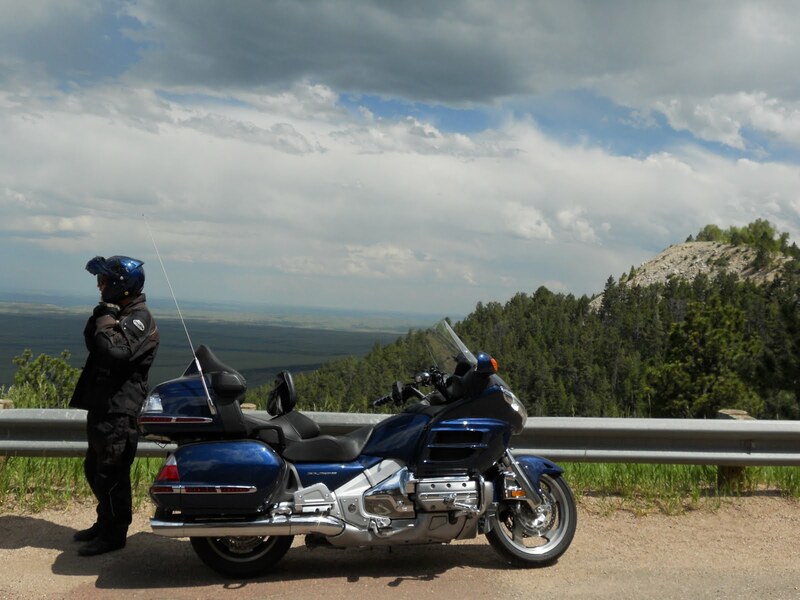 In August each year tens of thousands of bikers from around the world come to this unremarkable place on the northern edge of the Black Hills. Why? That is the question that has caused an itch in my thoughts all day. 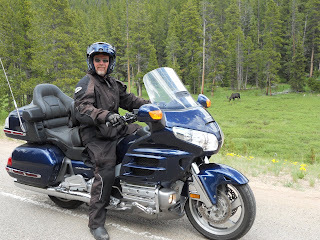 Despite being an ardent motorcyclist, the last place I would want to be during the 7 days of the Sturgis Motorcycle Rally is at the Sturgis Motorcycle Rally. This year the event celebrates its 70th Anniversary, and with it an anticipated attendance of 700,000 people. No, I did not add a couple of zeros. 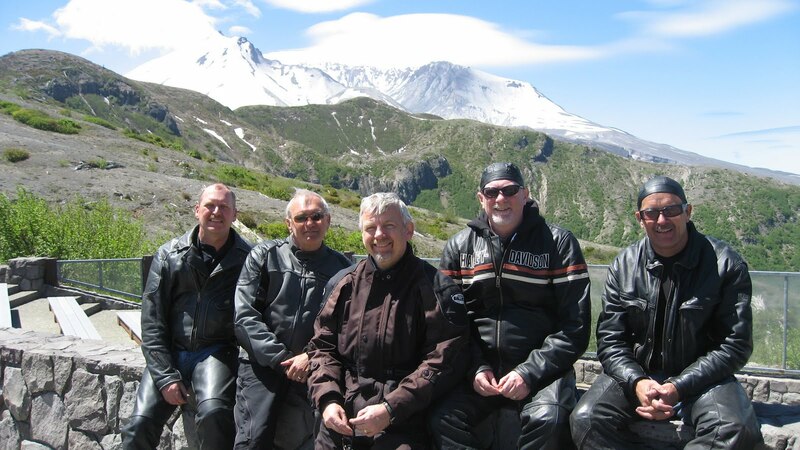 There will be almost three-quarters of a million biker types visiting a town with an official population at last census of 6442 (incredibly brave or twitterpated) souls. The Rally is, for many, the Mecca of motorcycle culture. In some respects it tries to live up to its image of a tough biker destination. But regardless of the reputation ("Good girls go to heaven. Bad girls go to Sturgis. "), the stats don't support the label. Despite the apparently tough crowd, in 2000 when there were 631,000 attendees there were only 10 Rally-related deaths, 359 parking tickets handed out, 111 people actually jailed, and 390 visits to the Hospital. G8 and G20 Summits resulted in more dramatic statistics. If it does not fit the annual 'bad biker dude place to be' label, why does it attract the masses. As one friend stated, "Perhaps it is just herd mentality." It has become, simply and inexplicably, the place for bikers of all description to congregate, if only to buy and then wear a T-shirt that proves one's attendance. 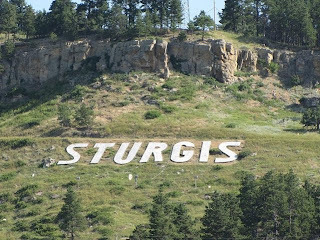 So why are we in Sturgis? Of course, it is not during the Rally, or we would be paying $400 a night instead of $85 for our modest motel rooms. 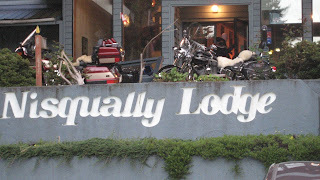 Mostly, it is to say we were here and buy a T-shirt from this motorcycle Mecca. The same logic, or lack thereof, was present when we went to see Mt. Rushmore today. We were quite ready to abandon the idea of actually joining the throngs going through the entry gates, replacing the urge to do so by simply snapping a few photos while posing along the road by the sign that said, "No parking, stopping or standing at any time". We are creatures susceptible to 'group think'. Witness the anxious desire to join in when passing the 'SALE' bin where others are frantically pawing through its contents like a dog digging after an escaped burrowing animal. Maybe there really is a phobia imprinted on our genetic make up. My daughter calls it "FOMO", the fear of missing out. Then following on that fear we seem to have the need for self-validation. If we invest time and effort into something (say a motorcycle convention of sorts), it would be rare for us to admit it was a waste of time and effort. We would rather sing its praises than complain about the poor choice we made. So how was my day? 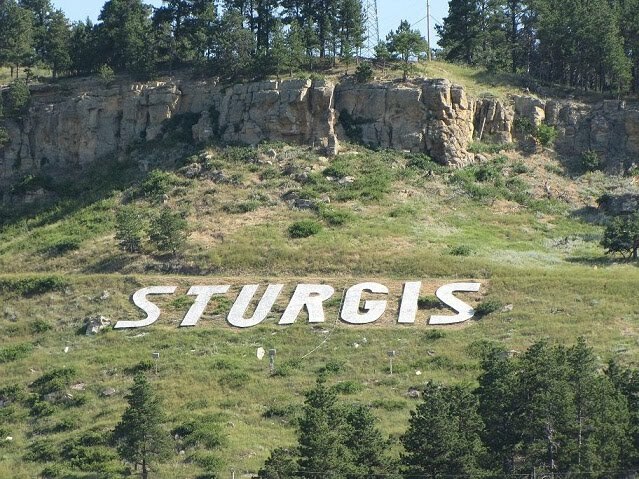 Well, Sturgis was a quiet town waiting for its population to grow by 100 times for one week. Mt. Rushmore was still there, standing tribute to an eccentric, incomplete and controversial project that has awed and attracted 2 million Americans and others annually for roughly the same 70 years as the Rally. It was a fascinating day of recognizing, without understanding or even appreciating, the human need for ritual. 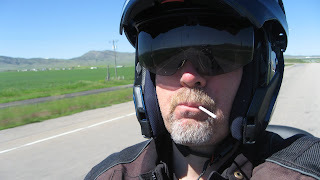 Like my habit of eating Tootsie Pops while riding cross country. Some days of every motorcycle trip call for dogged determination to cover distance to a destination. Today was one of those days. 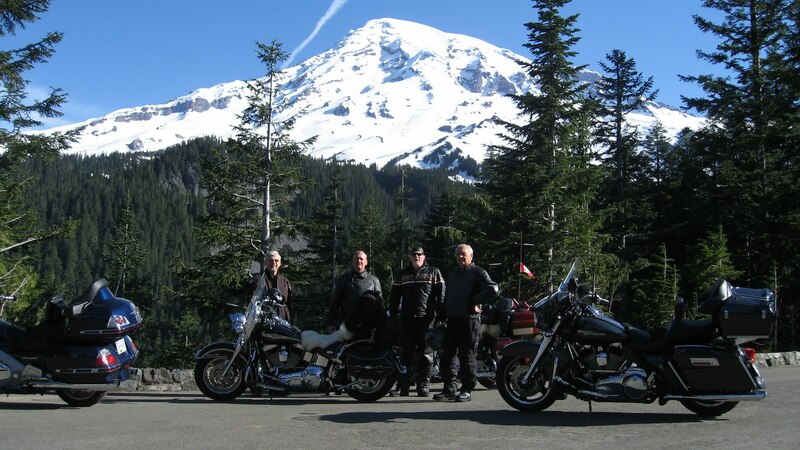 It was a great day; sunshine and very warm, no "events" to mar the ride, and lots of variation in the scenery as we travelled over 600 miles (975 kilometres). The day started with a 730 am departure from the motel in Missoula. 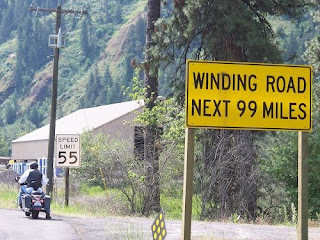 We literally flew east along I-90, as the speed limit is 75 mph, which we only rarely exceeded. At a place called Crow Agency we left the freeway for Highway 212, a scenic route dotted with historic but tired-looking towns like Busby, Lame Deer, Alzada, Muddy and Broadus. Each place was populated by a disproportionately large number of dilapidated buildings and few, if any, amenities. 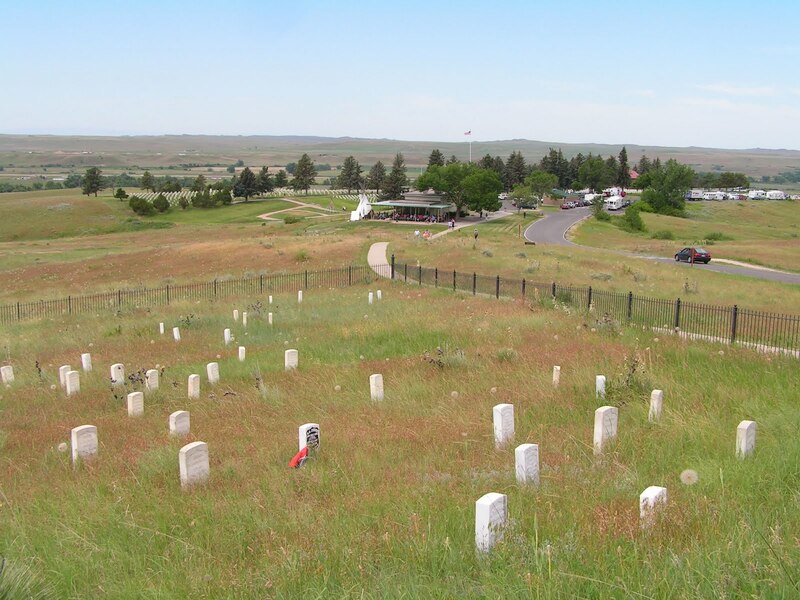 The reason for existence seemed to be limited to a cemetery, like the one at Little Bighorn, or some other footnote in some history text gathering dust on a library shelf somewhere. We went virtually the entire breadth of the great state of Montana today, ending around 8 PM in Belle Fourche, South Dakota, just north of the Black Hills and Mt. Rushmore. In fact, we are at the same motel, and ate at the same restaurant, as George and I patronized last year July 4. And there are still 4400 folks living in this town but, despite the re-paving of Main Street, it seems to be fighting a losing battle against age. It has past its prime. It was not particularly difficult day, just long, with the heat causing more fatigue than normal. We covered lots of countryside, interrupted infrequently by siting grazing antelope or some historic town clinging to hope and relevance in a world that passes by on freshly paved roads without any need to stop or even slow down. There was lots of time to think. I thought of my life and how sometimes parts of the journey feel more like perseverance than important. But I realize that my life has times when it is necessary to get to a new place if I am to stretch and take in an experience outside my current space and comfort zone. And there are times when I feel like one of those tired towns along the way, desperately wanting to be noticed and relevant rather than just getting a drive-by glance at a relic reminder of some faded historical fact. For me, the day was like my Parkinson's disease; a necessary discipline through a sometimes dry country, letting go of the past with its now outmoded dreams, and aspiring to a new direction with new challenges, new opportunities and new relevance. Imagine the fluid motion of a downhill skier carving S-shaped curves through new powder with a rhythm that looks effortless, but takes a dancer's concentration and repetitive daring attacks of the mountain like a bullfighter. One false move and the music will end in discord, the artistry destroyed. That is what a biker experiences. 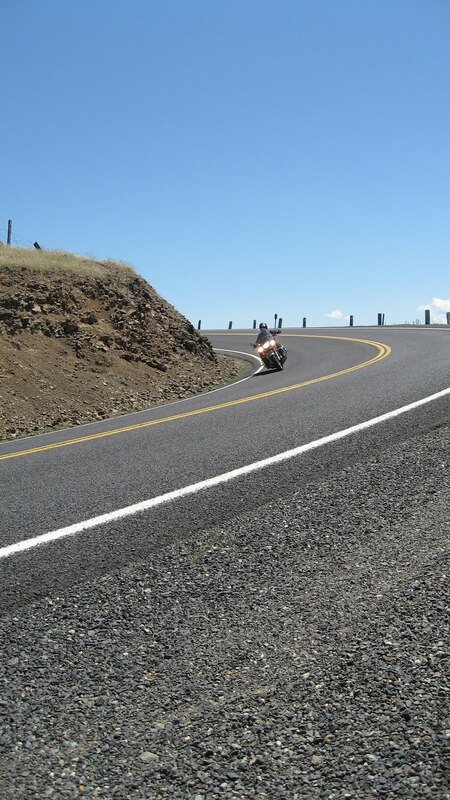 For most touring motorcyclists there are few more satisfying events than when riding a powerful machine on a highway slalom course of perfect turns. First left, then right, lunging and leaning into each corner as if to make it submit to the sidewall grip of the two tires. Then accelerating out of each curve as if whipped by a chain of skaters, hurtling almost out of control over the ground as if on blades cutting into ice. The rider pushes the machine while studying the road immediately ahead as if searching a typewritten page for the smallest error, simultaneously scanning the landscape on both sides the road for potential deer or other wildlife, or even an ignorant driver pulling back onto the pavement like a plane onto a runway oblivious to the aircraft coming in to land. Carelessness, by you or the errant motorist, can send you onto the shoulder or clamping hard on brakes in defence. 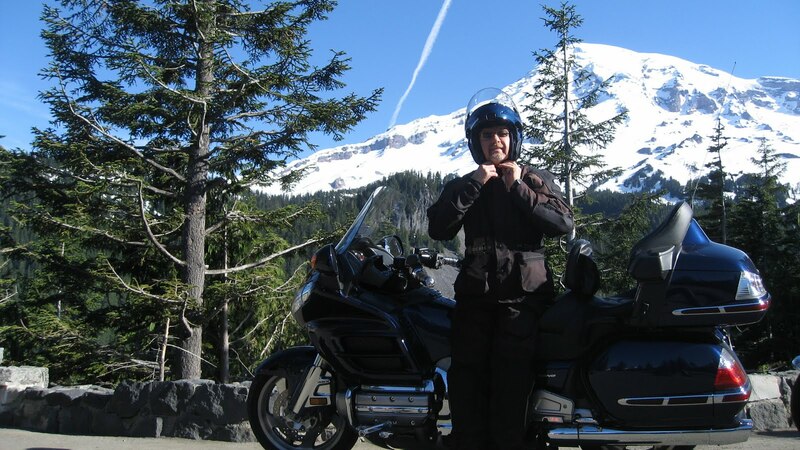 There are risks, as there are in any adventure, but care and caution reduce that concern without depriving the two-wheeled traveler of the thrill of conquering the highway. Today was spent vanquishing 600 kilometres (350 miles) in three States on some of the best asphalt to be had. Departing around 8 am we zipped over the undulating drylands of the southeastern corner of Washington. In the process we passed vast fields of grain that were literally mimicking the waves of the ocean in the wind, small American towns with stately courthouses decked out in preparation for the Fourth of July and lazy creeks and small rivers meandering through deep cut ravines to feed the demands of the great Columbia river. We were headed for Idaho and then Missoula, Montana, via the Lolo Pass Highway #12. We were familiar with this matron of great biking roads, having ridden it several times before. It boasts almost 200 miles of enough weaving and winding to thrill everyone from the most seasoned biker to the novice crouching over the stubby handlebars of a crotch rocket. There are seemingly countless 40 mile per hour bends the road that cling to the banks of the Lochsa River. It is the river that gave birth, and still gives character, to this route. Before starting Lolo Pass, we had a warm up and diverted to Lewiston Hill. It is a series of 30 mile per hour switchbacks, dropping a scenic 1500 vertcal feet down the steep hill above the Idaho town of the same name. We rode it both ways today, once for fun and once for photos. All in all it was a great day of sunny skies, safely scraping foot pegs on corners and enjoying great divergence of scenery. Just wait until I tell you about tomorrow. My relationship with Harley Davidsons has always been a friendly rivalry. That is, before today. Today held experiences in extremes. We were on the road before 8 am, ready for the day's challenges and adventures. Little did we know. It started off as a day of magnificent mountaintop experiences as we rode as far as possible up Mt. 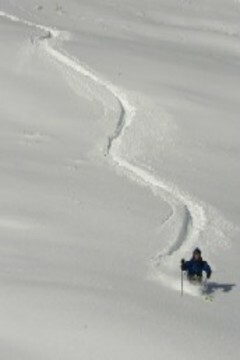 Rainier, 3 metres of snow on either side of the road, which kept us on the cool side of comfortable. Then we careened down a road no snake could duplicate until we reached Packwood, Washington, taking time for a decent cup of coffee and a muffin before we pressed on to our next pinnacle. You can get near the top of Mt. 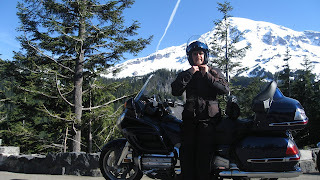 St. Helen's by two routes, one from the east and one the west, both great for motorcycles. 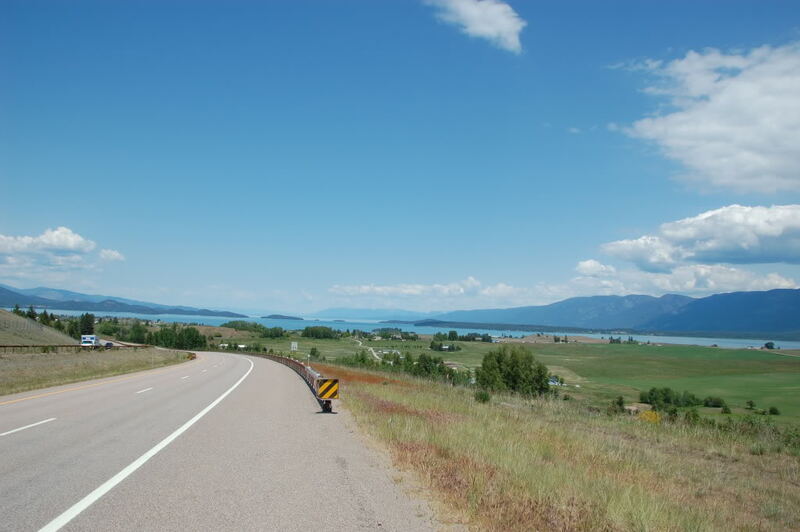 We had chosen the eastern "backside" as it allowed us to avoid the freeway and travel the curvaceous corners of Highway 131. It was a treat for all of us, with one exception. Windy Ridge atop Mt. St. Helens, overlooking Spirit Lake, has special significance for me. My father-in-law and Renae's brother-in-law had built the stone walls and other masonry there after the volcanic eruption of 1980 had taken its toll. What's more, I had worked there too. In fact, we passed the exact spot where I had cut and laid some stones on the back side of the wall of a lookout wall. Thankfully, visitors could not clearly see my amateurish masonry amongst what is surely artwork. I had no plan to stop at that "overlook", but we did. We were enjoying our way up the 20 mile ascent to Windy Ridge when we caught up with an older style Harley Davidson. He was slower than us, as were most vehicles as they doddled beyond logic. But I was in no hurry to pass, recognizing that the summit was a few miles ahead. As well, I was tuckered out from the number of corners I had conquered so far. But the blue Harley must have heard the clarion call of the view and at the last second he suddenly decided he would turn left and enter the "overlook " . He was not in the left turn lane, but I was, having interpreted his slowing down as an invitation to pass. Accelerating at the same time as he swung the old hog to the left I hit him hard, glancing off his bike with a sickening sound of crumpling metal and plastic. Wobbling, but still upright, I was able to stop in the wrong side of the road before reaching the edge of the drop off to an unknown conclusion. That was when the shaking began. I mean more than normal with my Parkinson's disease. But, amazingly, except for a dislodged highway peg, my bike was unscathed. Not so with the Harley, its engine guard bar was bent at almost a right angle, just barely short of preventing his front wheel from turning. He and I checked out the damage in relative silence. He seemed to know it was his fault but no allegations where stated. I stopped shaking twenty minutes later. I was thankful that neither my body, bike nor our trip were ruined by what proved to be only a scare. Honda meets Harley and comes away a winner! 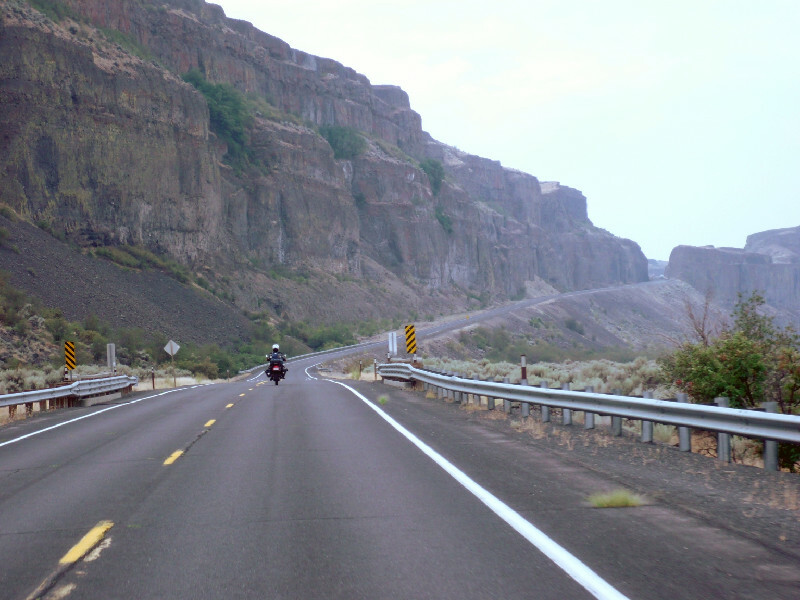 The rest of the afternoon was spent descending to the Columbia River gorge and then traveling east in what became a very hot 150 miles to our destination for the day, Kennewick, Washington. Arriving after doing a respectable 550 kilometres (300 miles) I was minus the visor from my new helmet, which had blown off earlier and ended up under George's front tire. But tonight, while enjoying an incredible Italian meal, we all agreed that the day had certainly been eventful. Maybe we had enough adventure for one day. Tucked under the chin of Mt. 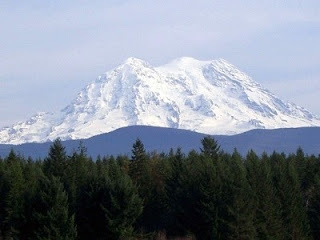 Rainier as if it were a violin, Ashford, Washington, is less of a town than a string of unbranded tourist establishments dotted along a five-mile stretch of Highway 605. Unique places, people and experiences occupy this tiny mountain community of 267 souls. 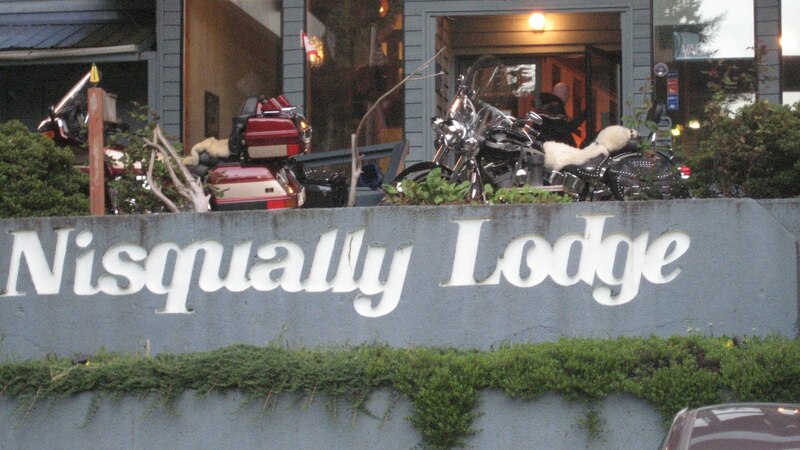 We (my diehard biking companion, George, and Ben and Steve, who work at Insight for Living Canada, and I) wheeled up to the Nisqually Inn in Ashford at 7 pm today. 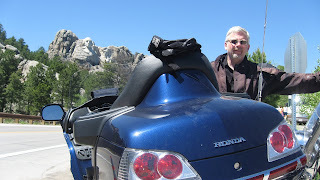 It is the beginning of a two week journey through some of the twistiest motorcycle roads of the Northwestern US. We had easily entered the US, crossing the border had been amazingly simple despite heightened security concerns. We headed south on I-5, that west coast thoroughfare from Canada to Mexico that hits every major city in-between. We had little in the way of excitement, instead joining Seattle’s slow-moving weekend exodus. George and I remembered the same thing last year and were glad it was not as hot this year. The problem I had was a developing headache and a mysterious-looking bright red spot in the middle of my forehead. 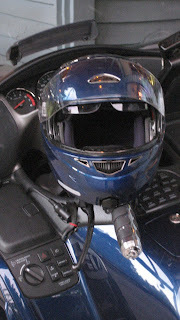 The most important gear for a motorcyclist of any type is the helmet. Having somehow badly scratched the visor of my old helmet by trying to clean it last night – the cleaner bottle said it could be used on plastic – I could not find a replacement visor so I had to purchase a new helmet this morning before we left. Apparently, helmets are like new running shoes. You don’t wear them for a marathon without breaking them in first. The blue (same as my bike) size XL felt like a good and snug fit in the store but began shrinking onto my head after 50 miles or so of riding. At 200 miles I felt a permanent dent was developing in my forehead. I am not sure what to do about it, but that is tomorrow’s problem. For now, just taking the helmet off felt wonderful. We were starved (not to mention very tired, and in my case I had only slept a fitful 3 hours the night before due to working until the early morning hours). “Where is a good place to eat around here?” I asked the elderly desk attendant, immediately sensing his frustration at my question given that he obviously wanted to vanish through the door behind him to continue watching World Cup soccer. “The Wild Berry” he said tersely. Thinking that sounded fresh and homey we took up his suggestion. After settling in at the restaurant we asked the typical question, but got an atypical response. “Yak steak” the distinctly Tibetan server stated nonchalantly in answer to our request for the ‘special’, as if this was as common as meatloaf or fried chicken. The specialties of the house were all genuine Himalayan dishes, and tasty, at least based on my choice of the chicken curry over basmati rice, with Tibetan rice pudding for dessert. Who would have guessed that my first experience with food from Tibet would be in the culinary centre of nowhere, Ashford, Washington? Tomorrow I will introduce the fifth member of our adventuring group. He put our modest first day mileage to shame by having traveled 1200+ kilometres (720 miles) today to meet us. But for now, I need some sleep. Although I foresee dreaming of having head butting contests with Yaks in Tibet all night. Most people spend their lives looking forward to things. The weekend, a celebration, a new car, a vacation, a promotion and raise, seeing old friends, or just a rest. These are the thoughts that take up residence in the dreams of optimists. Others, of course, wonder who emptied the top half of the glass as they dread the uncertainty of the future. Fears of being alone, losing a job, failing a course, having a flat tire, or just not knowing what the future holds. Until I was diagnosed with Parkinson's disease, my tomorrows would almost always look better than today. My dreams were lush jungles of adventure filled with certain success and achievement. Fear never did more than stalk the edges of my tomorrows, and then only long enough to face inevitable conquest and banishment. But since my turning point in January 2006, I seem to need a constant parade of new things in the near future to keep me looking forward with a positive attitude. After all, the prevailing direction for those of us facing a degenerative disease such as PD is a slow, in relative terms, spiral downwards. Think about it long enough and the potential future seems filled with tremors increasing until they rival the great San Francisco quake of 1906, stiffness setting in like slow curing concrete, and loss of balance becoming more akin to drunkenness than disease. And that is just the beginning of symptomatic responses to the diminishing supply of dopamine being produced in one's brain. Our future is not typically marked by celebrations with bright colored balloons, streamers and confetti. So what are you looking forward to? I have discovered that positive anticipation can be a critical weapon in the arsenal to fight the insurgency of Parkinson's disease. The best part is that this is something we can create with a little discipline and planning. 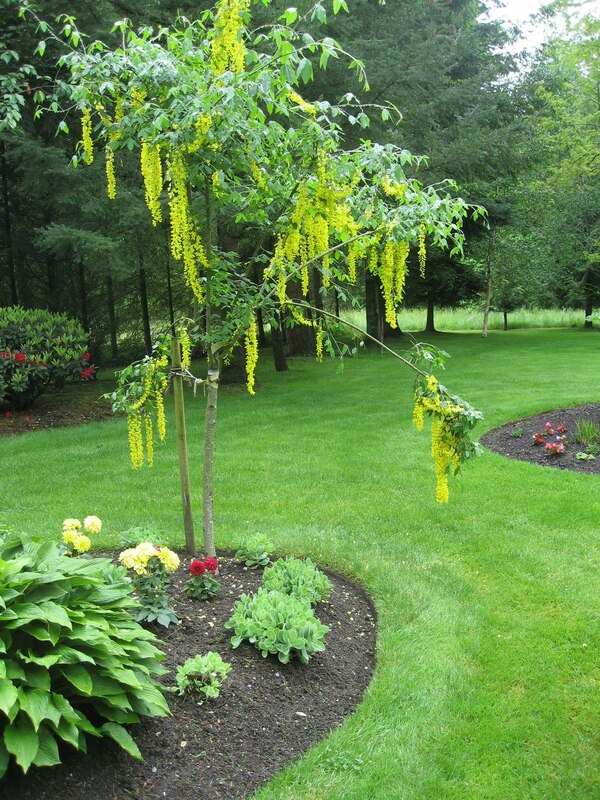 For me, anticipation is an antidote to anxiety about an uncertain future. Often times when I find myself focused on the fear of future disability, I can fight the darkness that would smother me by simply saying to myself, "Yes, I know. But in just a few days/weeks/months I will be...!" Nothing could be more relevant recently than the need for positive anticipation to offset the sometimes depressing demands of a far too busy schedule. 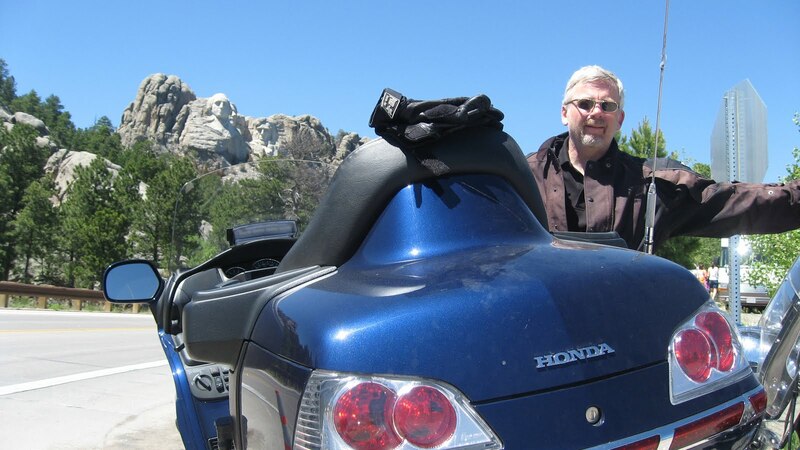 So right now I am anticipating leaving Friday for a two-week motorcycle trip in the northwest United States. 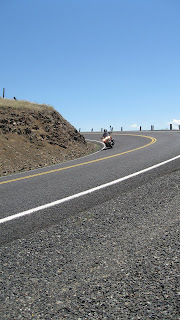 Despite the potential for some pain and discomfort from cramped muscles, few things rival the exhilaration of cruising through corners on two wheels with wind, scenery and smells buffeting my body as I lean into the camber of the road to counteract the centrifugal force at play. 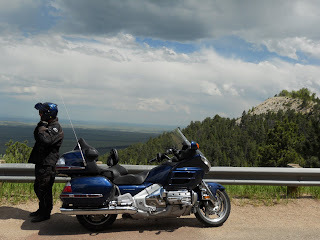 Hopefully, this little bit of anticipation will whet your appetite for future postings as you come along with me as I describe (mostly for my own mental picture album) the experiences and (mis)adventures as the Knights of the Open Road ride again. I woke up early this morning. Earlier than I had hoped, but nothing unusual. Each night's sleep is an uncertain journey, interrupted a few or many times depending on the extent of my PD-addled nocturnal preoccupations. Swinging my legs over the edge of the bed I find myself experiencing two wildly disparate feelings, one recurring and one new. First, I am pleased, as I am every morning, that Parkinson's disease has not yet made it difficult to get out of bed. There is no stiffness that often plagues others who struggle to take their medication and wait for it to take effect before rising. I can only imagine the frustration of waiting, thinking of the necessary and pressing, as well as a desirable, things to be done. 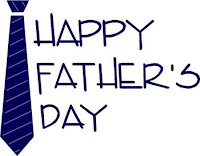 Second, it is Father's Day. A collage of emotion collides with that realization. 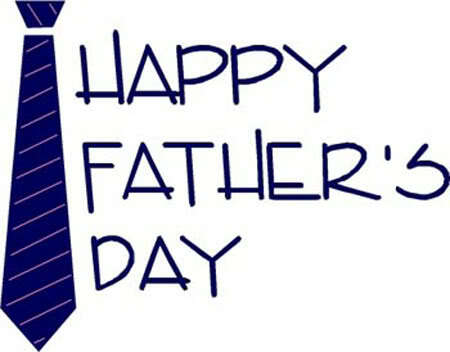 It has been 16 months now since I could express to my father my profound appreciation for all he did for me. I miss being able to articulate my gratitude to him, although that is not just an annual sense of loss. My memories of him, especially his living with Parkinson's disease, still school me in ways I never would have considered possible when I was younger. Thank you, Dad. 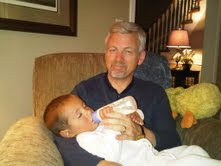 At the same time I am thankful for the opportunity to be a father, and grandfather. Although there is sometimes worry and heartache that go with the role and responsibility, there is also great joy and gratification. I have learned so many invaluable lessons from my children, and through my struggling to be the best father I can. Despite my many failures, I have a deep sense of peace that I have passed on to my children, as best I can, the values that are most important. Now I am much more the prayerful and caring bystander than the director or decision-maker for their lives. Which is as it should be. Stepping into my den this morning, as my place to be alone with my thoughts, I was greeted by a large gift bag. On top was a card expressing my wife's appreciation for me as a Dad (very sweet, but entirely undeserved, as it is she who is the better parent). Inside the bag were two gifts, both entirely appropriate, thoughtful and cognizant of my ongoing wrestling match with PD. The first included a Starbucks gift card with a collection of travel-size toiletries: toothpaste, Chapstick, shampoo, deodorant and (hint, hint) mouthwash. As I will be leaving soon on a guy’s two-week motorcycle trip, these items express her support for my addiction to adventure despite my health challenges. Although I will need to ask her what I am supposed to use the antibacterial wipes for. The second present was a state-of-the-art electro-energy converter, Arcitec RQ 1050, flex and pivot action, three-headed machine, also billed as "the world's closest rotary shave". You see, shaving has become a little more treacherous recently. Unless "death by 1000 cuts" is a literal form of execution, I doubt that I would have died from blood loss while shaving. However, shaky, left-handed, face scraping has redefined "safety razor". This new electronic device will sit alongside my electric toothbrush reminding me that as things get more difficult they can also be made easier. Now, if I can only figure out how to turn this machine on! Oh well, I may have to read the instructions. "Winning isn't everything, but losing is nothing." True? Well, partially. It is unclear what "Peanuts" cartoonist, Charles M. Schulz, meant by the phrase he coined. But it sounds like something Charlie Brown would say as he stood on the pitcher's mound of that mythical baseball park wondering what he could do so that his team would win just one baseball game. 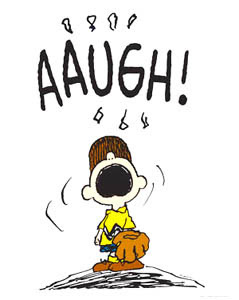 Schroeder, Lucy, Linus and even Snoopy were losers when it came to baseball. What is winning? 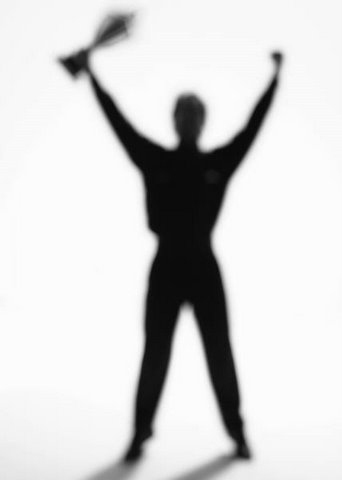 When it comes to life with Parkinson's disease, how do we end up being winners? What if we cannot beat PD? Are we losers? Like many other wise statements, the words used in this cartoon-based maxim require definition. Defining words and concepts for others is far less important than how we define them for ourselves. I have been struggling lately with the concept of "losing". As I age, accelerated most likely by my degenerative disease, I have experienced loss. Most of us, including me, resist looking at that reality. But failing to do so means we cannot learn from "losing", and I suspect that if you are like me you do not learn from winning either. Wisdom comes not so much from winning, but from losing and refusing to stop there. It comes from learning from the losses we experience. 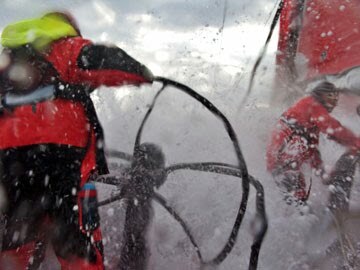 An old English proverb states, “A smooth sea never made a skilled mariner". Those of us who are sailing the turbulent sea of Parkinson's disease have only two choices: use the lessons taught by our loss of dexterity, vitality, balance, mobility, stability and even confidence (not to mention loss of speech, smell and smile) to learn how we can pass on what we have learned; or give up, knowing that barring a miracle we cannot "win" the fight against PD. Today, I learned from my grandson. It happened like this. Due to my right arm being weak and painful when lifting anything of any size or weight, I could not easily lift him, being the stout 18-month old toddler that he is. So rather than sweeping him into my arms for my customary bear hug as he puts his head on my shoulder, I was forced to get down to his level. This had me on my knees, looking him right in the eye. I saw him differently. We played at his level for the rest of the evening. We both sat in his little picnic table on the back deck. I draped over the edge of the bathtub has he played with his toy boat with the little men who sat in their circle, triangle or square slots on its deck. But, after a long day at the office, I was spent. But even in that loss of ability to give anymore watched him drift off to sleep while I held him having his bedtime bottle. My "loss" had become a very satisfying "win". I have recast the "Peanuts" cartoonist’s statement: "Winning is not everything, but losing is nothing (unless you do something with it)". Parkinson's Disease Means Constant Calibration. My right arm has been worse these days. 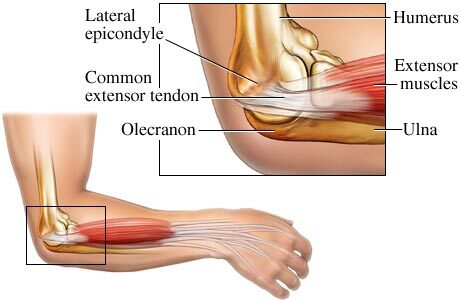 Whenever I straighten my arm, pain shoots up from my seemingly knotted forearm muscles, through my elbow to my shoulder, striking home just inside my shoulder blade with the same affect as a lightning bolt. This occurs whenever I try to lift even light objects. A towel from the rack to dry off after my morning shower. A binder from the bookshelf over the credenza. Lifting up PJ my grandson as he raises his arms for a hug. As a result of these limited daily feats of strength my arm muscles jam and screech to a halt. It is like when in Typing 9 I would "accidentally" press a handful of typewriter keys at once, requiring that I reach in and pry the letters from their jumbled collision with each other so that I could continue with the speed exercise. As a result I find myself pleading with my booked up physiotherapist to fit me in more often. I promise him that I will increase my contribution to his retirement savings plan, or his next vacation to Italy. He tells me that this muscle-twitching mayhem is my body's way of reacting to the endless Morris Code-like mixed up messages from the brain to my muscles. The tremor, he says, is the muscles’ confusion in trying frantically to discern what the brain is shouting: “Stop! No, go! Stop! Go!” No wonder the dopamine cells lead a rebellion and, like lemmings, heedlessly run over some cognitive cliff, falling to their deaths. My physio kneads my aching arm like noncompliant clay. Then he applies ultrasound. And finally, he resorts to shock therapy (low voltage, but my right ring finger still involuntarily curls into my hand as if to hide there until the voltage goes away). How do I measure the speed of Parkinson’s progression? How fast am I getting worse? When will I lose the ability to function nearly normally? Are the storm troopers laying siege to my tired body that so often seems at risk of being toppled? What is normal? How do I calibrate this body to keep track of the degeneration happening? Wikipedia, the seeming authority on all things sublime or substantial, says, "Calibration is a comparison between measurements - one of known magnitude or correctness made or set with one device and another measurement made in as similar a way as possible with a second device. The device with the known or assigned correctness [our once-upon-a-time normal body and brain] is called the standard. The second device is the unit under test [our PD bodies], test instrument, or any of several other names for the device being calibrated." Right now it is the constant ache of my right arm that I need to recalibrate and forget the standard set by my pre-PD self. I need to redefine “normal” for my arm and its ability, at least for now. And keep doing so lest I become defined by the progression of this unrelenting disease. But, given that we are all aging, perhaps each person needs to recalibrate their own definitions for what is “normal”. It is Friday. It is late. I am exhausted from the week of work and other worries. 6 hours sleep last night. Up at 5 AM. No nap today. But I refuse to go to bed. I will not let the fatigue treat me like some whipped puppy being shooed off to my corner to sleep. It is my own little act of rebellion. I sit in front of my computer and read cases recently decided and posted on the British Columbia Supreme Court website. Or I read e-mails, check blogs, or review my daily Google Alerts on recent world developments or news stories related to Parkinson's disease. And, of course, often I write positivelyparkinsons postings. It has become my silent protest against the logical thing to do; get some sleep! I begin to wonder whether this is some Freudian refusal to "die". 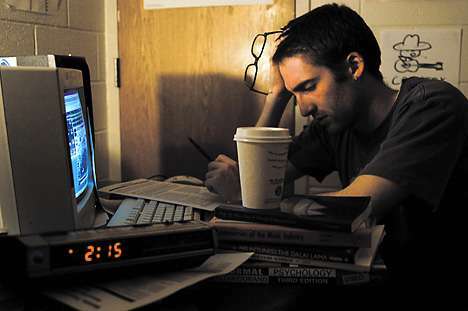 However, I have concluded that "staying up late" is defiantly seeking control, pursuing freedom. A friend recently said, with resignation, that he was having trouble coming to grips with the idea that at 50 he can no longer "do it all". As we age it can feel like our choices become more limited. We do not have the resilience, the reservoir of energy, the enthusiasm or sometimes the audacity to "just do it". My Parkinson's disease constantly reminds me that I am losing control of my body. And age itself slices like a scalpel into the sharpness of my memory, sometimes leaving me without the right word, someone's name or a clear recollection of an important event. The younger, tech-savvy generation rises like a tidal wave, threatening to overwhelm my ability to remain on the cutting edge of developments in my profession. At 57, am I losing control of my life? "Freedom 55" must be a cruel joke, a myth perpetrated by investment dealers and "wealth managers"? Ironically, this reminds me of my 18-month-old grandson and his love of stairs and keys. Until recently fear kept PJ from even attempting to crawl up the curved staircase in the entryway of our home. But, inevitably, like all helpless babies who are growing into their 2 year old independence, he has began to assert his need for freedom to make his own choices. He giggles excitedly as he stretches his short legs up to the next riser, clinging to the spindles with one hand while he turns, beaming, to watch me follow a few steps below. He will spend several more decades in this process of asserting himself, and inserting himself into the world around him, making choices, taking control, and experiencing freedom. Anyone experiencing the progression of PD will feel a commensurately deepening sense of loss. But, like any loss, be it the inability to hold a teacup still enough to raise to your lips, having your driver’s license revoked or being unable to move due to "freezing", the loss need not define us. I may lose my self-importance/pride, some of my self-image/vanity, and even elements of my self-worth/misplaced identity to the extent it is tied to my perceived ability to control the world around me. But I cannot and will not allow any disease, misfortune, event or even person to take away my determination to be the person God made me, with an irrepressible ability and need to make choices. For as Voltaire, the French philosopher, said, "Man is free at the moment he wishes to be.” We are only as free as we choose. As for me, as irresponsible as it may sound, I choose to prop my weary eyelids open, shake my already shaking fist in the face of this disease, and stay up ridiculously late on Friday night.